Low cost and low maintenance, DIY-friendly pea gravel patios appeal with wonderfully non-pretentious beauty. Outdoor spaces add value, not only for resale, but in lifestyle terms as well. If you’re in the process of designing a patio, the breadth of possibilities may strike you as overwhelming. Even the seemingly simple task of deciding on a patio material can prove daunting: Concrete, brick, tile, stone, pavers and other popular choices each have their own pros and cons. Cost. In comparison to other patio materials, inexpensive pea gravel lends itself to easy do-it-yourself installation. Hey, even a complete novice can shovel! Drainage. Pea gravel can help to prevent erosion, because water doesn’t run off its surface, but rather soaks right through into the ground. For this reason, a gravel patio doesn’t need to be graded on a slight incline, as is the case with other materials, such as patio pavers. Design. 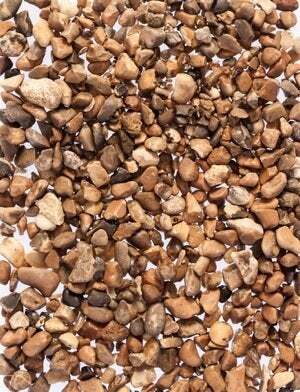 Flexible to use, pea gravel pours into any area delimited by landscape edging. No matter what shape or design you choose to give your patio, the material is likely to prove itself suitable. Landscape Barrier. Install landscaping fabric beneath the patio to separate dirt and gravel, so you don’t end up with a muddy mess in a few seasons. Also, the fabric discourages weed growth. Surface. A loose material, pea gravel shifts underfoot. Small stones compact better than larger ones. If you want to counteract the stones’ tendency to shift, put a honeycomb stabilization layer over the landscaping fabric, then infill with gravel. Maintenance. A pea gravel patio is fairly easy to maintain. To keep its surface evened out, you’ll need to rake the stones back into place occasionally, but the only real challenge is snow removal. Light snow may be removed with a leaf blower, while the trick with deeper snow is to shovel until there is a thin layer you can melt with salt. 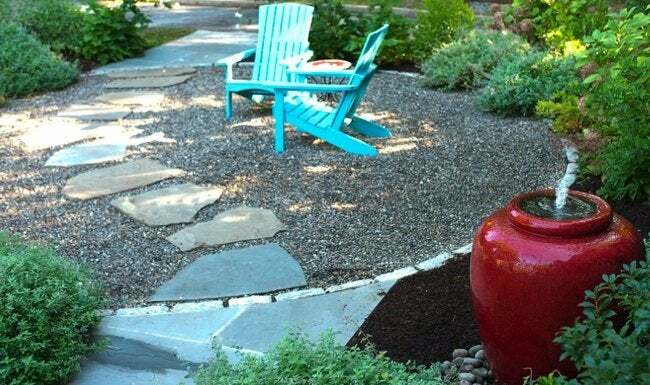 If you’ve hesitated over the expense and labor of adding an outdoor living area, consider a pea gravel patio for its low cost, ease of installation, and mostly hands-off maintenance. Not to mention, pea gravel can be very beautiful in its characteristically non-pretentious way.